Since that point in time, it’s fallen from favor, while the popularity of Cabernet Sauvignon continues to grow. 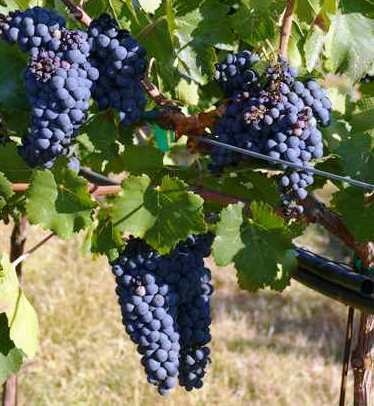 However, over the past decade or so, there has been a resurgence in the popularity of Petite Sirah in California as plantings have continued to increase. Petite Sirah can age for decades. In fact, it often demands 2 decades or more of cellaring before it becomes civilized and fun to drink. I’ve had 40 year old bottles that were fresh, concentrated and vibrant. Petite Sirah is the American name for the Durif grape. Durif takes its name from Dr. François Durif, who created the new grape variety when he successfully crossed Syrah with a grape called Peloursin. At the time the experiments were taking place, Dr. Durif was searching for a way to make Syrah more resistant to powdery mildew. While the new, resulting vine was more resistant to disease, due to the compact way the fruit grew in bunches, the grape clusters are so tight, they were susceptible to bunch rot. The French discounted the potential for the new grape because they believed it produced sub-par wines lacking the same textures or aromatic complexities found in Syrah. Today, the grape known as Durif in France is only approved for planting in one appellation, Palette, which is situated in Provence. While Durif did not become popular in France, it was not long before Petite Sirah found a home, first in California and later in Australia. In California, growers began planting the grape as far back as 1884. The grape began appearing in Australia by 1908. For years, Petite Sirah continued gaining in popularity in the Napa Valley before eventually falling from favor. Today, several California producers make wine from 100% Petite Sirah, while others use it as a blending grape with Zinfandel, Syrah and even Cabernet Sauvignon. When blended, Petite Sirah adds structure, color and a tannic backbone. It can also help to reduce the overripe, jammy character often found in Zinfandel. Like many grape varietals, Petite Sirah is best when the fruit comes from old vines. Perhaps the two best sources for old vine Petite Sirah are found in the grapes planted in the Hayne and Library vineyards. Both vineyards are located in St. Helena California. While Hayne vineyards has vines more than 70 years of age, the historic Library vineyard has vines that were planted as far back as 1890! Those special old vines gives the fruit incredible concentration and density of flavor! Old vines are important for another reason for Petite Sirah as the grape is prone to high yields when young, unless it’s cropped back. While Petite Sirah can be relatively easy to grow, due to its natural inclination to produce massive, tannic wines, which can often be on the rustic side, wine makers and growers need to be careful to manage the tannins. This can be done by achieving ripeness and gentle extractions. Over the years the popularity and agreed on spelling for the variety has changed. At various points in time, the wine sold as Petite Syrah and Petit Syrah. But today, the only recognized spelling for the grape is Petite Sirah. It’s not only the spelling that has changed for Petite Sirah over the years, so has the amount of acres planted to grape. In California, Petite Sirah was at its peak of popularity in 1938 with 7,285 planted acres. The reason so many vineyards were planted to Petite Sirah in the 1930’s was the grape was immensely popular with home winemakers during Prohibition. However, the amount of the grape planted across America was almost cut in half by the late 1960’s when only 4,289 acres were devoted to the varietal. Things were even worse by 1990 when barely 1,400 acres remained. Today, Petite Sirah as never been more popular in the Golden State. By 2014, more than 164 growers and 897 producers are working with the grape. Currently, close to 10,000 acres of vines are planted to Petite Sirah in California. Australia has the second largest amount of acreage devoted to Petite Sirah, with close to 1,000 planted acres. Petite Sirah makes a powerful, fruity, hardy, dense and often tannic wine which really pairs perfectly with a wide variety of big dishes. Meats, stews, braised and grilled meats are excellent food and wine matches for Petite Sirah. Short ribs, hamburgers and barbecue of all types served with Petite Sirah works as a food and wine pairing as well. Petite Sirah produces inky dark, purple colored wines that offer flavors of black pepper, blackberries, blueberries, spice and licorice. Do not confuse this grape with wine produced from the similarly named Syrah variety. They are not the same grape and they do deliver similar taste sensations. Petite Sirah wines are often, massive, intense, chewy, masculine wines that when they are young, provide massive amounts of tannin and high levels of acidity. Wines made from Petite Sirah have the ability to age and improve for decades. Some of the top producers of this distinctive California wine include; Turley, Switchback Ridge, Jaffurs, Robert Foley, Quixote, Robert Biale, Alta Colina and Carlisle. Hold on to your hats for this one. Starting with the 2012 vintage, Sine Qua Non entered the Petite Sirah sweepstakes with their release of a Petite Sirah and Viognier blend called, “The Writing On The Wall!” Only 350 numbered bottles were produced, which became another instant collectible from Manfred Krankl selling for as much as $7,500 for the single bottle in the boxed set!